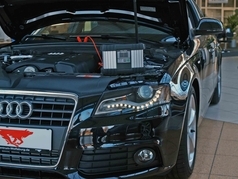 Regular battery care in the showroom is becoming more and more important for vehicles with modern electronics systems. Nothing is more embarrassing for a sales advisor than wanting to show a client the many functions of their "dream car" only to find they won't work because the battery is flat. To say nothing of the poor impression this makes on the customer in terms of the make and the dealership. But why do the batteries in demonstration vehicles always go flat? The main reason is that modern vehicles are fitted with an increasing number of electronic components that provide increased safety, lower fuel consumption and greater comfort. It goes without saying that an increase in the number of electronic devices also increases the demand for power. On modern vehicles the battery discharges itself much more quickly. that require currents of up to 70 A. Just opening the car door "awakens" a number of control devices from their sleep mode causing currents of up to 45 A to flow for several minutes. Electronic accessories that the prospective customer may want to try out in the showroom use up even more energy. The engine is never started in the showroom, so it is the battery that supplies the necessary power. The battery will become more and more discharged and increasingly sulphated if not recharged promptly. In the worst case, damage to the battery is so severe that the only option is replacement, with unnecessary costs arising for a new battery. Advertising and marketing efforts by manufacturers and dealers ensure that demonstrations of new models always generate a high level of interest, resulting in packed showrooms. The new car will be thoroughly put through its paces by customers and all the focus will be on new technology in the vehicle. When windows are being rolled up and down, navigation and infotainment systems tried out and the boot automatically opened and closed, the battery is of crucial importance. On-board batteries on popular new showroom models soon become overworked and the voltage can drop below 12.2 V. The same is true of detailed vehicle demonstrations. As a consequence, some in-car electronic systems will shut down automatically y and no longer work. This could be disastrous if the impression produced causes a potential buyer to draw negative conclusions about the overall functionality and quality of the vehicle and this puts them off. It may take as long as two hours to hand over an executive or luxury vehicle with many electronic features to the customer. If the customer is used to driving a different make of vehicle and is not familiar with the systems on the new vehicle, the handover may take even longer. During handover the customer adviser will explain all the features of the new car to the customer. Normally the engine is switched off while all this is going on and the battery serves as the power source. Unless the battery has been hooked up to a charger, the customer will be driving off from the forecourt with a depleted battery. For the automotive trade, advertising campaigns and trade fairs form a key component of any sales strategy. Wherever the demonstration takes place - in a pedestrian zone, at an event or trade fair - the vehicles on show always generate high levels of interest. If the demonstration is taking place indoors, certain legal conditions apply. Often the battery has to be disconnected or, in some cases, the oil has to be drained off. Whether or not the battery is connected, a reliable power supply is required for a successful demonstration. The energy demands of the on-board power supply are particularly great during periods of high interest. Without a permanent and reliable power supply, the battery voltage soon drops. As a consequence, some in-car electronic systems will shut down automatically and no longer work. 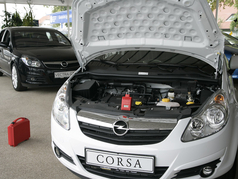 The high demands made on the vehicle battery often means it is so depleted that the engine will not start after the demonstration. 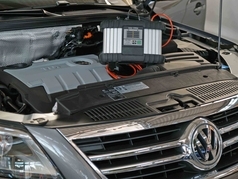 These days, regular battery care for used vehicles is essential. 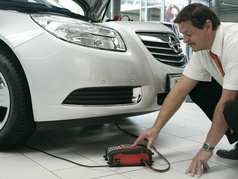 If cars are not used for long periods, the battery discharges itself resulting in damage to the battery. The effect of the weather on cars left in the open only serves to exacerbate the problem. 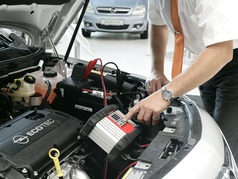 Regular battery care helps to prevent defects and avoid additional costs for replacement batteries. A fully-charged battery means the used vehicle will work properly when it's needed, meaning demonstrations and spur-of-the-moment test drives can go ahead without a hitch.